I can not find the Sketchup download page with Google! I end each time on a page with a form that leads me to the online version of Sketchup. Where to find SketchUp for windows or mac? It’s bad for SketchUp that this page has not been found with Google! Is this bug or a voluntary act of Trimble? 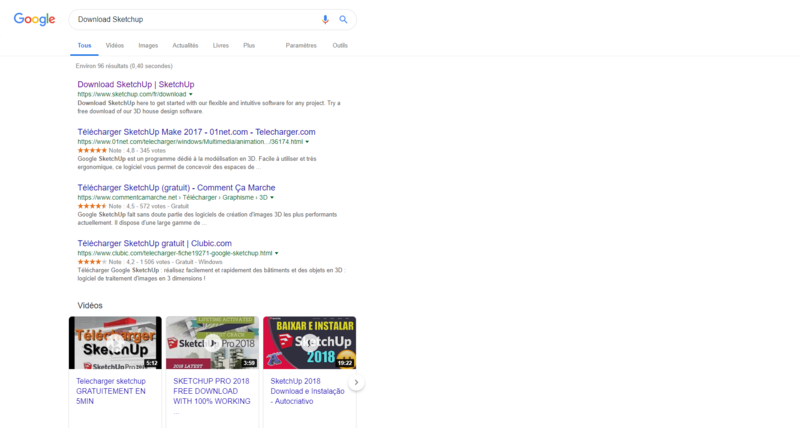 FYI, I tried searching for sketchup download on google (US) just now; the first result is the overall SketchUp home page, the second result is the download page. Why of Trimble, could be equally eval by Google ? Search engine optimization for being found on the internet is nice and beneficial for users, and thus for Trimble. But making use of a browser’s address bar becomes more and more forgotten. Google France can no longer find the downloads page, fortunately it is not the case everywhere. In writing only SketchUp, I find the same result but none of the links open the downloads page, do you? I think Trimble now prefers to direct users to the online version of SketchUp. It’s easy to hide pages in search results and point to others. The future of SketchUp to install on our computers is doomed. We are witnessing an unprecedented technical regression with the ideal online version for children. I find this unfair to all who have given their hearts to their souls at work to advance SketchUp! What a sad future we are going to have! Fortunately you couldn’t be more wrong. For various reasons, a web client will not be a good substitute for good old-fashioned installed SketchUp - connectivity, performance, etc. However, a web client is a perfect product for some people - lab users, education, chromebooks, etc. Using both products we can satisfy the needs of the power users and casual users! What people may not realize about the web version is that it uses the same underlying code as the desktop product, so it’s actually much less effort to develop than one might guess.